This post is sponsored by Arm & Hammer and Gold Medal Flour and has been compensated by Acorn Influence, Inc. and its advertiser. All thoughts and opinions are, as always, 100% my own. 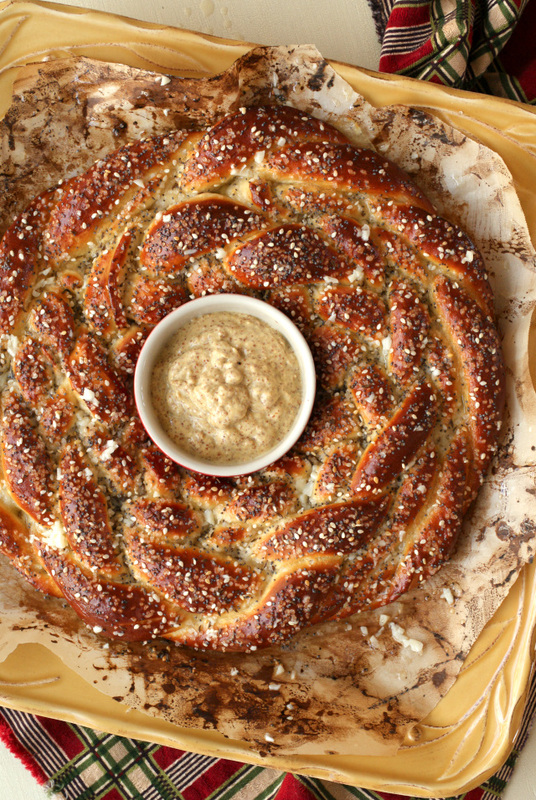 A Cheese Stuffed Braided Pretzel Ring transforms traditional baked soft pretzels into a beautifully braided wreath that is cheesy, garlicky, buttery, and totally party-perfect! What comes to mind when you hear the words holiday baking? You think of cookies, pies, cakes, and other sweet delights, am I right? I'm sure that's the direction that most people's minds naturally go. Not me, though. I'm the girl that loves to get into the kitchen for our holiday cookie baking extravaganza every year and then I'll eat maybe two cookies. Total. Like, all Christmas. The baking tradition part is so much fun and I look forward to it every year, but if you don't dig sweets, you don't dig sweets. And I just don't dig 'em. That's why, when I walk into a holiday party, I'm skipping the cookie plate and making a beeline for the savory treats. At my holiday parties, you'll always find a variety of savory goodies right alongside my carefully crafted cookie platter. Something for everyone! Holiday baking doesn't always have to mean cookies. It can mean things like flaky croissants, fluffy dinner rolls, and golden challah bread! No matter what your baking preference, sweet or savory, holiday baking is like a full-time job. I like to make a list of everything I'm going to make and stock up on all of my baking supplies so that when I'm ready to roll, I am prepared with all of the baking staples I need. Naturally, quality brands like Arm & Hammer Baking Soda and Gold Medal flour are always on the list! I stock up on both at Walmart (in the baking aisle) so that I'm good to go when I'm ready to bake. This year, if you are hosting a holiday get-together, don't forget about your friends that like to walk on the savory side! 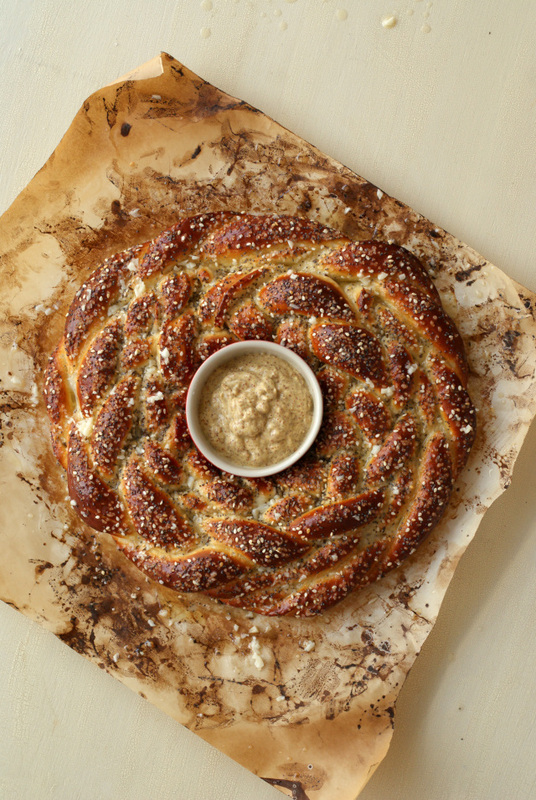 Get creative with your baking and include a savory treat like this gorgeous cheese-stuffed braided pretzel ring. This is my kind of holiday baking! 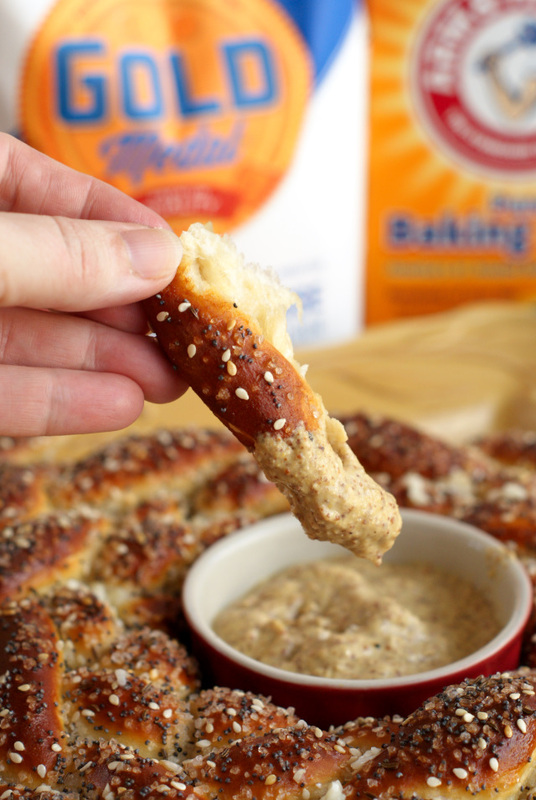 Making homemade baked pretzels is so much easier than you might think, and with the addition of a little bit of cheese and some pretty braiding, a simple soft pretzel is transformed into a stunning party-worthy treat. Better yet, don't wait for the party to serve this deliciousness, make it to munch on while you are baking cookies for the party! That way, your kitchen is guaranteed to be the center of holiday fun before the party even starts. Yes! Everyone is going to love digging into this awesome pull-apart pretzel in all of its cheesy, salty, buttery goodness. Don't forget to pick up your Gold Medal flour and Arm & Hammer Baking Soda at Walmart to get ready for all of your holiday baking this year! Combine the yeast, warm water, and brown sugar in the bowl of your stand mixer fitted with the dough hook attachment. Let sit until foamy. Stir in the salt and melted butter. With the mixer running, add the flour, 1 cup at a time, until a dough forms and is no longer sticky. Knead dough for 5 minutes. Form dough into a ball and place it back into the bowl to rest for 15 minutes. Preheat your oven to 475 degrees. Line a large baking sheet or pizza pan with parchment paper. In a medium saucepan, boil 3 cups of water with the baking soda. Once the baking soda is mostly dissolved, take the mixture off of the heat and pour it into a shallow dish to cool down. Take the dough out of the bowl and flatten into a disk. Cut dough into 8 sections (like a pizza). Roll each triangle into a long rope, about 20 inches long, and then roll out with a rolling pin until it is 2 inches wide. Place cheese down the center of the dough, fold the dough over the cheese, and pinch to seal. Braid three pieces of pretzel and repeat with 3 more pieces to make two long braids. Twist the two remaining pieces around each other to make one twisted piece. 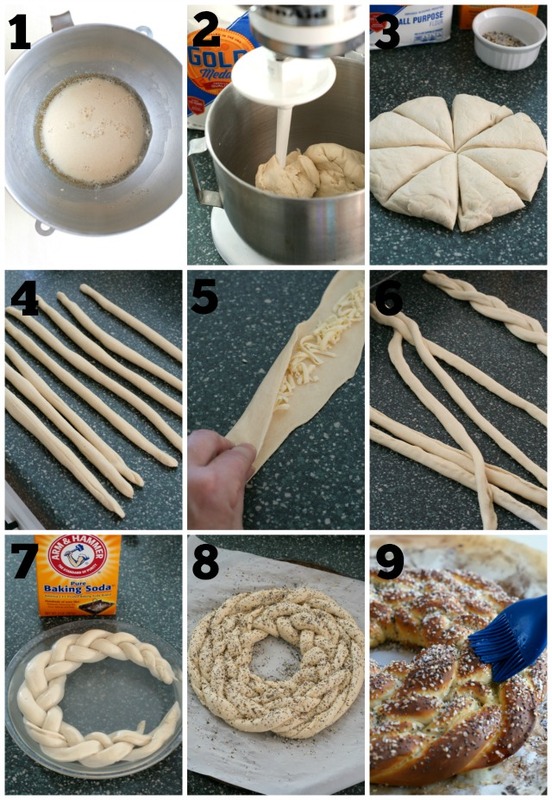 Place each braid ring into the baking soda bath for 2 minutes. (If the whole pretzel isn't covered by the water, spoon it on top of the areas it doesn't reach.) Carefully place onto the prepared baking sheet and re-shape. Wrap the braids into a wreath shape leaving a hole in the center, and wrap the twisted piece around the outer edge, tucking the loose ends under. 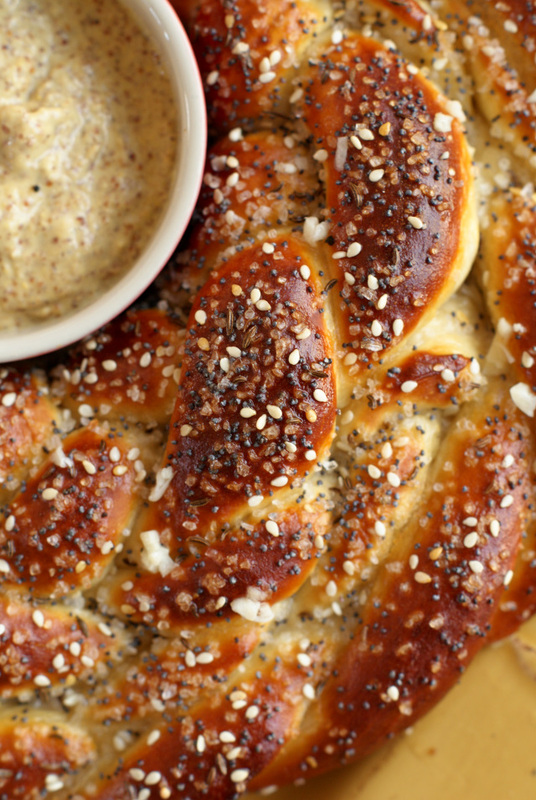 Sprinkle the pretzel with coarse salt, poppy seeds, sesame seeds, and caraway seeds while still wet. Bake pretzels for 8-9 minutes or until golden brown. Melt 5 tbsp of butter in a small saucepan over medium-high heat. Cook the garlic in the melted butter for 1 minute. Remove from the heat and carefully brush the pretzels with the melted garlic butter. Place a small bowl of your dip of choice in the center of the ring for dipping. Get creative with your dip choice! 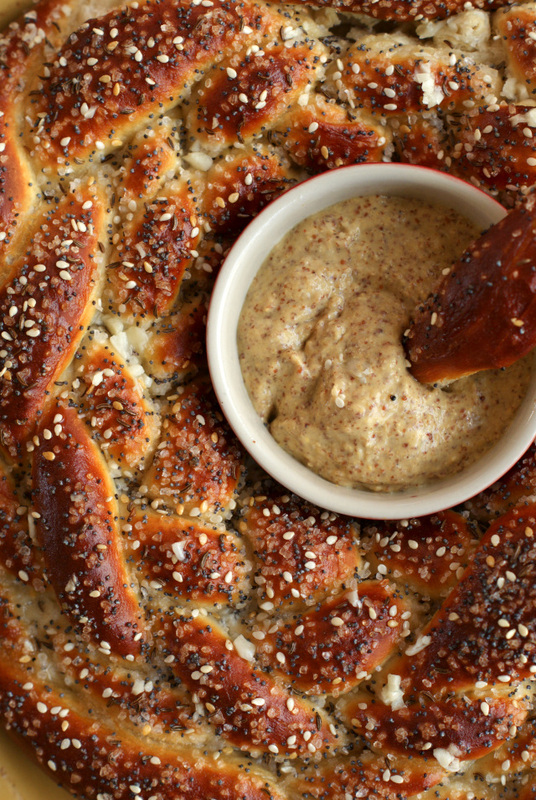 Try dipping your pretzel in mustard, marinara, pesto, or a beer cheese. 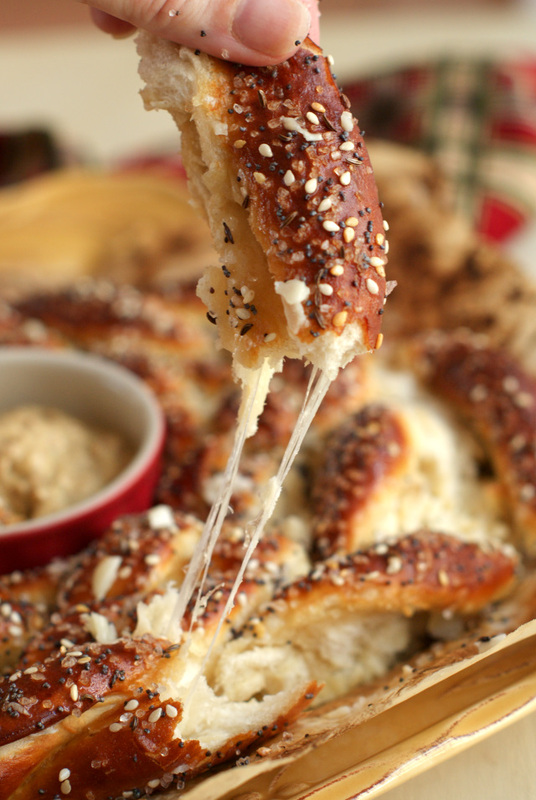 This pretzel recipe will taste great with any savory dip you choose! I stuffed my pretzel with mozzarella because it is a mild flavored cheese that would go with any dip. Depending on your dip choice, you could also stuff your pretzel with spicy pepper jack, bold cheddar, or omit the cheese completely. This post is sponsored by Gold Medal flour and Arm & Hammer. Use the hashtag #BestOfBaking to join the conversation on social media!